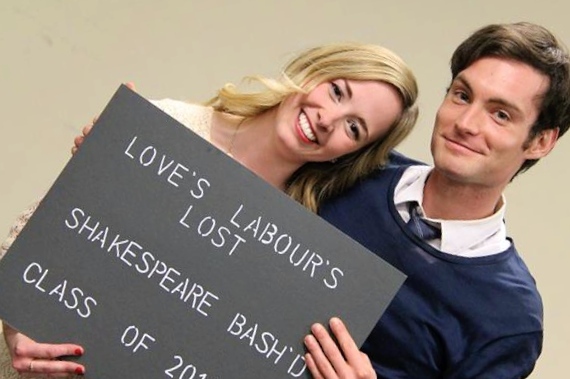 As I entered the rehearsal hall for Love’s Labour’s Lost (presented by Shakespeare BASH’d) I was struck by the amount of people in the room. 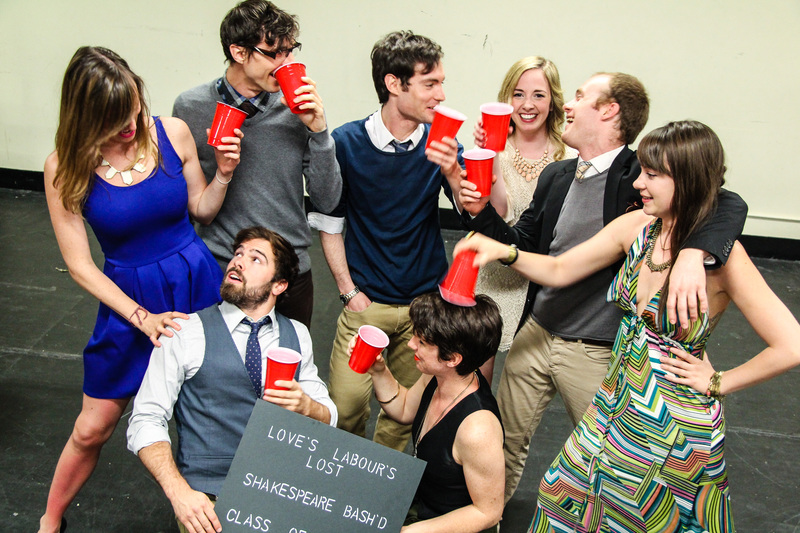 With no role double cast, the cast of 16 generated such an exuberant atmosphere that I couldn’t believe they had just finished a run. Their attitude as an ensemble reflected the youthful energy of the play. In Love’s Labour’s Lost, the King of Navarre and his three men swear an oath to remain celibate so that they can focus on academic pursuits. Unfortunately the day after the men swear this oath, the Princess of France and her three ladies—a group of fierce, grounded, intelligent women—arrive on a political mission. Passion, poetry and chaos ensue. I sat down with the four—that’s right, four—pairs of lovers to chat about their character’s relationships, their own quirks and the upcoming Fringe production. Hallie’s Pet Peeve: Slow walkers. Post-Show Drink of Choice: “Wine wine wine” (Hallie), Hawaiian Pale Ale (Jesse). Hallie: We’re both people in power. We like to outwit each other, top each other. We don’t want to admit that we’re into each other but we are. We totally are. Jesse: We’re both the leaders of our kingdoms so that definitely plays a part. But why I’m attracted to her is because she’s not afraid to push back. I don’t see her for many pages after the first meeting, but when I do, I am really in love with her. I’ve written all of these poems about her. Once you’re in, you’re in. Suzette’s Pet Peeve: Bus windshield wipers. Jeff’s Favourite Rehearsal Snack: Chocolate chip cookies. Suzette: They have such a love/hate relationship, as in they love to get the best of one another. Rosaline would like to pretend she doesn’t love him or that she’s better than that. But she’s very intrigued by his wit. She thinks he’s smart and he can hold his own next to her. She also sees his cons and can be open about that. She can be herself with him. Jeff: They had met before at the same party [as Longaville and Maria] and for Berowne he doubts the oath the men all swear to right from the beginning. He doesn’t really think it is going to work. Berowne’s always had control over his emotions and has never fallen madly in love. When they first meet, what Rosaline says to him, how she uses her wit and beats him at his own game, it really intrigues him. He doesn’t really get it, being in love, he’s taken aback. He almost goes through the seven stages of grief, but more like the seven stages of love. He doesn’t understand why but he does truly love her. Josh’s Rehearsal Snack: Cigarettes. If he could eat ’em, he would. Post show drink of choice: A glass of Scotch (both). Catherine: It’s so instantaneous for everyone, but Dumaine and Katherine have moments of looking at each other and trying to figure each other out. It’s really playful. I get to be aggressive which is fun. We all tease the boys, which for Katherine is her way of playing hard to get. But she’s so obvious when she’s around him. Joshua: We don’t have a lot of text together, or any really. But we have built this aspect of Katherine being the aggressor. I catch her checking me out at the beginning and I’m a bit more timid. I’m sort of shocked she likes me. Similarly [to the Princess and the King] we have many pages where we don’t see each other at all yet I’m madly in love and have written horrible poetry about her. She’s also pretty sassy. I like that. Sheelagh’s Pet Peeve: People who stand really close to you for no reason. Also, toe shoes. Andrew’s Favourite Rehearsal Snack: Nuts, specifically almonds. 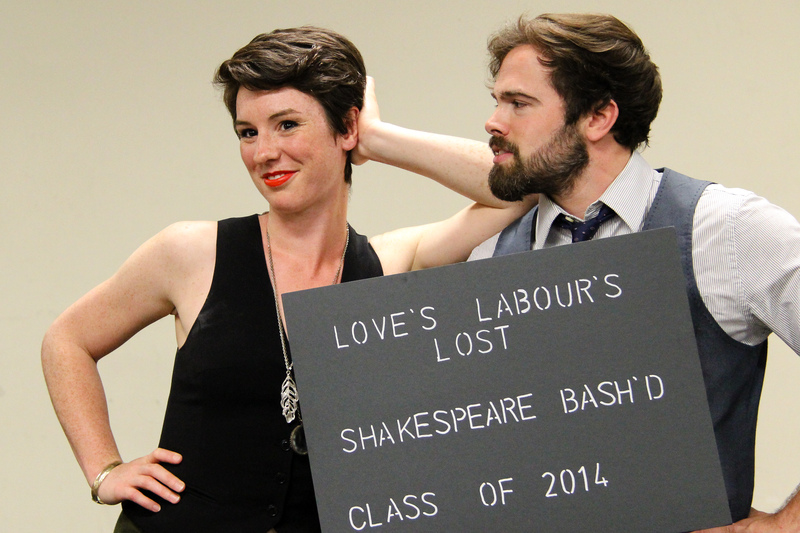 Sheelagh: We really like each other right from the beginning. There’s no qualms, we know we’re going to get together. I play along with the Princess but whenever Longaville’s around I’m just making googly eyes and waving. Even when the rest of the girls are berating and chiding the boys, I’m just still waving at Longaville. Andrew: We kind of met before, it seems we were at the same party. I’m the most serious in terms of the oath the men swear [to stay away from women]. And then I see Maria and I throw it all away. It’s funny watching how I try to logically get around the oath in my poetry. Bailey: What makes this production stand out? What will an audience member experience coming to see your show at the Fringe? 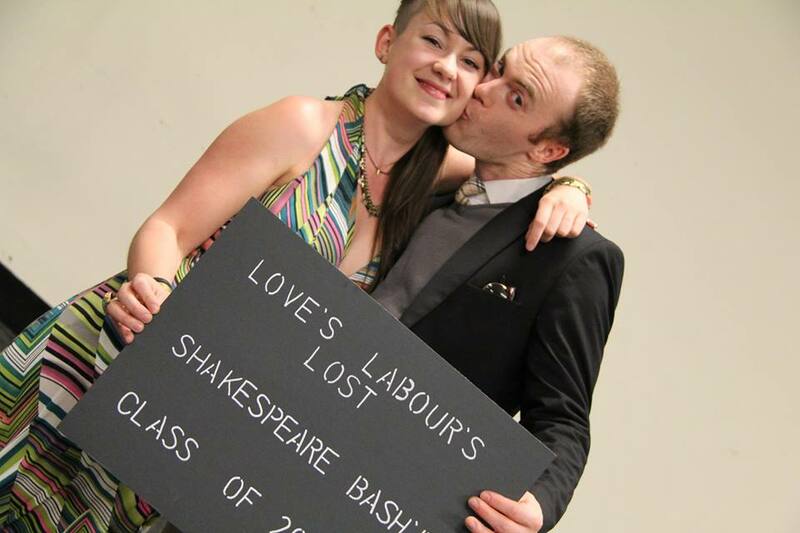 Jesse (King): Love’s Labour’s Lost is a very youthful play, it’s one of Shakespeare’s earlier work and it has a rhyming structure which is really unique. The women hold their own. And it’s not a play that is done very often. People are going to be coming out to see a show where they can have a beer and experience a classic that they may have never seen on stage before. Josh (Dumaine): It’s zany. The men are writing really bad poetry and dressing up as “Russians”. The show is going to be fast, snappy, fun and silly, but it also has vulnerable moments. It’s really relatable. Hallie (Princess): James [Wallis], our director, said at the beginning that the best way into this story is through yourself. These characters come alive through the energy of the people doing them. And in this cast you have a bunch of really interesting, funny, weird and smart people who come out through the words of these characters. That’s what makes it fun. I hope that will stand out to our audiences. Suzette (Rosaline): The characters play the whole time! Let’s play this game, let’s play that game. Whenever I see a BASH’d show I feel like I’m part of the team as an audience member, that I’m part of how the story unfolds. Each time we run the show there’s new surprises. And it’s so refreshing to be in a play where my character doesn’t have to be a lost puppy who only cares about being in love. It’s a love story, for sure, but there’s an edge. My goal in life is not just “to be loved by another person.” I still feel that’s very rare. Jeff (Berowne): People will get a sense of [director] James’ respect for the text, but there’s also a joy and a sense of ensemble and the fun that this rehearsal room has been that I feel will be evident for anyone watching. The audience hopefully should go through the journey with us. Andrew (Longaville): There’s a real sense of great respect for the text, but also using it as a blueprint. There’s a balance of not bulldozing the words, but really using them and at the same time using yourself in the text. Hallie (Princess): All pomp is taken out of it with a BASH’d show. It has that “Fringe” energy. You go to the Victory Cafe just a step away from the tents and everything that’s going on in the Mirvish alley. You can sit down and have a beer and listen to a classic tale that is so clear and fresh and fun and full of energy. It’s enjoyable, which is sometimes exactly how you want to spend your time. There’s also wonderful dance that happens that I cannot WAIT for each audience to experience. Bailey: Well I for one can’t wait for the dance number. Where? 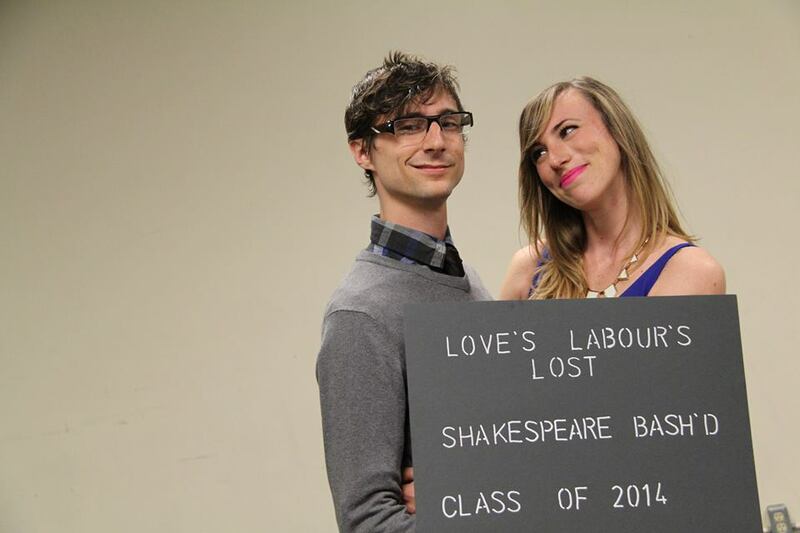 The Victory Cafe, 581 Markham St.
Meet the couples of Shakespeare BASH’d’s Love’s Labours Lost, appearing at the 2014 Toronto Fringe!